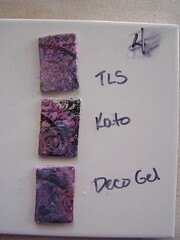 This is phase two of comparing the three major brands of liquid polymer clays: Fimo Deco Gel, Kato Liquid Polyclay, and Translucent Liquid Sculpey (TLS).Â Phase one consisted of checking out viscosity, odor, and results after one layer was applied and baked in the oven. Since I’m interested in building up multiple layers for dimension, I thought I should test the 3 products and cure them by hand with a heat tool. For reference, I have one that has only one heat setting. (And I don’t even know exactly what that is!) To compare, I used small tiles I made by running the clay through the thickest setting of the pasta machine. 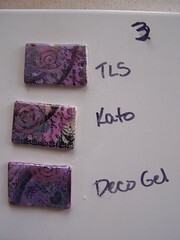 I added mylar to the raw clay and stamped on it with pigment ink, and them cured them before adding liquid clay. After 2 layers, (here seen with and without flash) I noted that the TLS took longer and more effort to clarify. I had to really heat it intensely for a while to make it glossy. 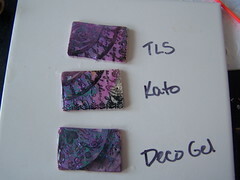 Kato and FDG both cured easily and were very clear. 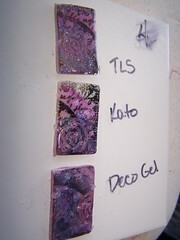 So this time I spread on my layer of liquid clay, and then sprinkled some glass micro beads into the liquids. I then cured with the heat tool as before. 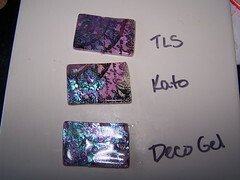 Because the TLS and FDG are thicker, the beads stuck on easily, and moved only a little during curing. 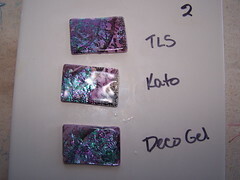 However, the Kato is so thin that the beads actually started to slide off with the force of the heat tool. I had to quickly change my approach, and use a circular motion around the perimeter to set the outside edge of the clay, and then work in toward the middle. Again, the FGD and Kato cured easily and clear. 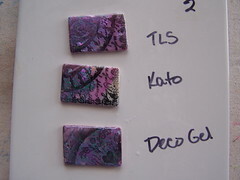 The TLS is getting cloudier, though, and it’s harder to see the designs on the tile. I guess there are very salient reasons to have all three on your worktable. After all, oneÂ glue won’t serve you for every application you might need, so why expect that from your liquid clay? This post is great, Jenny. So much information, good information. 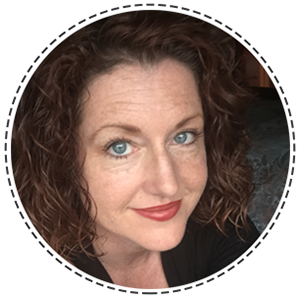 Thanks for experimenting and sharing your r results. The pieces you made look very cool. 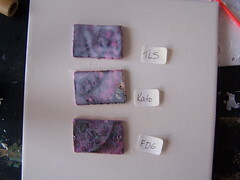 I haven’t played with polymer clay or liquid clay in a good long while. I should pull it out and start playing with it again. Thanks for the inspiration. Thanks for the comparison, Jenny. 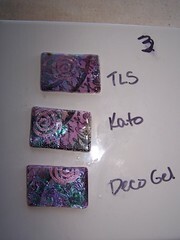 I’ve preferred Kato Liquid Clay for glazing & TLS for “gluing” for a while now — but I hadn’t tried Fimo & was wondering if I was missing out. I appreciate your thorough review.